This month I bring you a jewel! 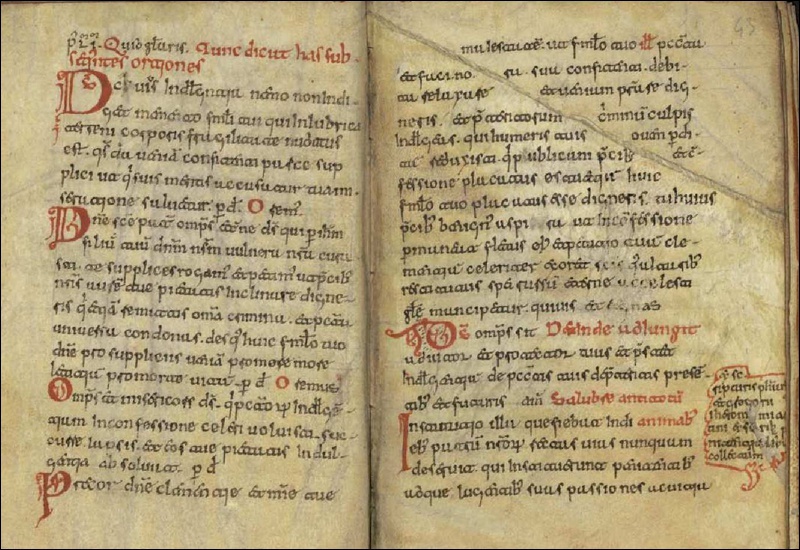 A codex that is not only unique for it contains the only extant copy of Buchardus’ Poenitentiale in Visigothic script but an authentic Frankenstein of a manuscript! Don’t believe me? One of its kind! Let’s start by talking about the content of the book: Buchardus’ Poenitentiale. I am sure some of you are well acquainted with Burchard of Worms (c. 950/65-1025), bishop of the Imperial City of Worms, in the Holy Roman Empire. He was the author of a canon law collection of twenty books completed around 1023 known as the Decretum or Decretum Burchardi that became a highly influential and popular source of canonical material. The Decretum cites a variety of biblical, patristic and early medieval sources, including the Old Testament, Augustine of Hippo, Gregory the Great, Isidore of Seville, Hrabanus Maurus, and Julian of Toledo. 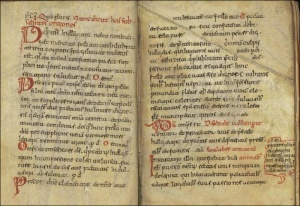 As a source of canon law, it was supplanted by Ivo of Chartres’ Panormia, which utilised and built upon large sections of the Decretum, and by Gratian’s Concordia discordantium canonum or Decretum Gratiani, a much larger collection that attempted to further reconcile contradictory canon law. The main point here... Book 19 of the Decretum is the so-called ”Corrector Burchardi“, a penitential or confessor’s guide including a list of every sin imaginable and punishments for each which Burchard added to his Decretum as a sort of appendix. That is the work copied in this Visigothic script codex. What type of work is this, you might be wondering? 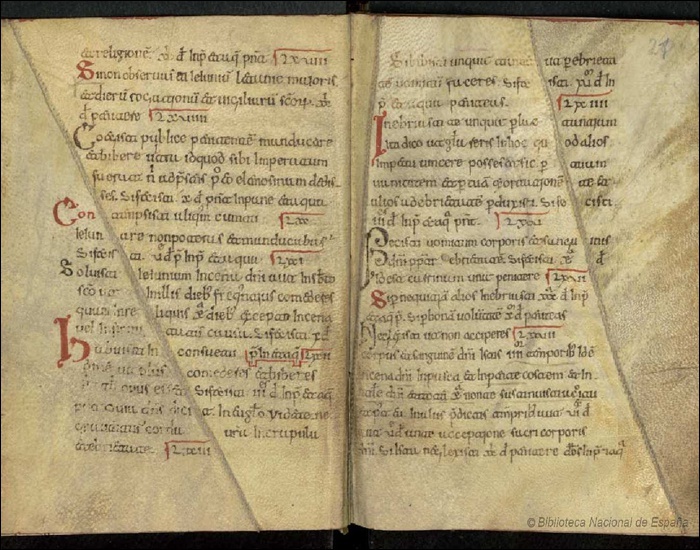 Here an example: The Joy of Confessing: “Women’s Vices” and Burchard’s Decretum of 1003. © Madrid, Biblioteca Nacional, mss 6367, fol. 20v-21r. 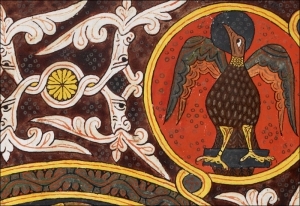 And now the codex: Madrid, Biblioteca Nacional, mss 6367. It is a 95-folios codex of which almost all, 75 being precise, originally belonged to another codex, probably an Orational. So, what happened here is that these 75 pages of the Orational, with all the ruling and pricking, were scraped or washed off, the content erased (what makes it a palimpsest), and above it, the Penitential was copied. As a result, the copyist needed to adapt the new text to the structure of the quires, ruling, etc. the folios already had, what resulted in a (let’s be honest) not the neatest of his works, I imagine. Besides, some folios seem to have been already damaged, so he needed to carefully sew together pieces of parchment onto one another! © Madrid, Biblioteca Nacional, mss 6367, fol. 31v-32r. Where did all this happen? 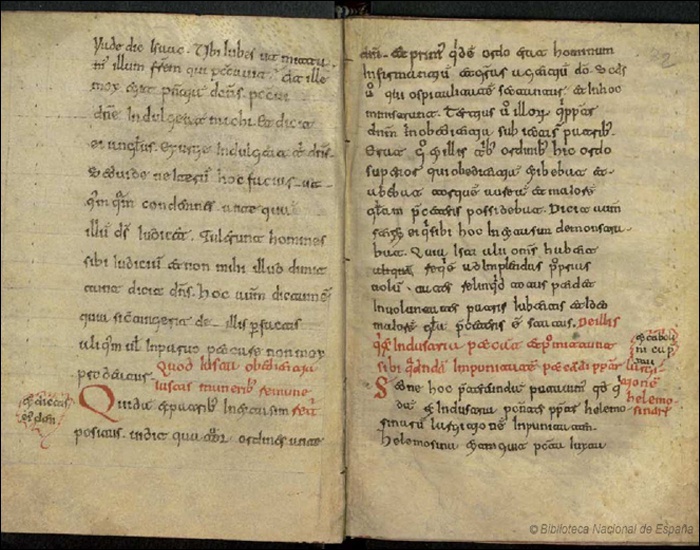 There are very few remnants of the original manuscript for us to be able to date and place it with certainty (some specialist argued for the 10th c. though), but we can work with the Penitential. Judging by the characteristics of the script, it has been placed in the area of Castile (it is too formal). The date, as mentioned in the codex, 1105. The script is a functional Visigothic minuscule with a heavy Caroline minuscule influence particularly in the abbreviation system, as usual, besides that in the general aspect of the script (rounded). It has been proposed as production centre a monastery more likely nearby the Camino de Santiago. Was the codex used? Indeed it seems it was! Throughout the codex, there are quite a few notes on the margins, by different hands, with comments on the text, on the sins and punishments. So it is clear the codex was read and used in confessions, in a practical way, as a reference. What happened to it? Well, as usual, we do not know for certainty. What we do know, for it is also mentioned in a note in the first folio, is that the codex was given to the king Felipe II by the bishop of Vic, Juan Bautista Cardona, in the 16th c. It had arrived there somehow. The codex reappeared in the Convento de San Vicente in Plasencia from where it arrived at Madrid in 1753. What do you think? Do you know of other codices that look like this one? M. C. Díaz y Díaz, Códices visigóticos de la monarquía leonesa, León 1983, 425-426, nº 152. A. Millares Carlo, Corpus de códices visigóticos, Las Palmas de Gran Canaria 1999, nº 161.